The last time we discussed good reasons to rehearse we noted 3 good reasons why rehearsing your presentation is a good idea. We noted how rehearsing is good for your confidence, it helps you to edit your presentation and it helps with your presentation technique. But there are other reasons why you should want to rehearse your presentations. You can rehearse your props. Try to rehearse your team presentation handovers. Look to rehearse your presentation for feedback. Note how these good reasons to rehearse your presentations are a bit more involved than our earlier tip. These suggestions anticipate a team presentation, perhaps. Or, maybe a presentation with ongoing feedback. 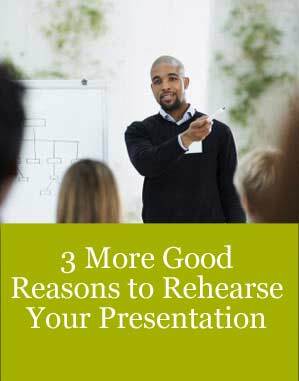 Here are 3 reasons why you have to rehearse your presentation. Rehearse your props so you become a more fluent presenter. Practise your team presentation handovers so your presentation flows easily from one section to another. Rehearse your presentation for feedback so you benefit from other opinions before the big event. Using props can really help you explain your content to your audience. And those props can be essential when you want to build understanding with your audience. Just take a look at how these police presentation props went down with the Nebraska audience. But like everything, you can use props well or you can use them indifferently. Aim to rehearse with a prop. Use the prop to explain a function. Use the prop to discuss some key characteristics. Or, use a prop to assess some qualities. However you intend to use a prop it’s always good to practise beforehand. Presenting as a team can be very productive. But you want the presentation to flow, and flow well at that. You should really aim to rehearse all the essential links between the speakers. Try to practise the essential handovers between each of your presenters. These worked particularly well in the MH17 team presentation. It can be a good idea to get all your speaker introductions done at the very start, so you don’t waste time introducing each speaker as you proceed with your presentation. That way you can focus on the links between each logical stage of your presentation. We reviewed the essential team presentation tips in an earlier article. When you work in an office with fellow professionals you’ve got the perfect opportunity to get their feedback…before your presentation. Securing feedback before you present will boost your confidence making you a better presenter. Explain to you colleagues the purpose of your presentation. Indicate your prospective audience and your objectives for the presentation. Then look for their feedback in a structured fashion. We tend to use our own feedback form for structured feedback. You can download that feedback form (a pdf document) here. Rehearsing your presentation is essential. If you intend to use props, you are planning a team presentation or you want feedback before you present there’s really no better alternative. Just consider how practice made perfect for these Hawaii presenters. Aim to rehearse your presentation with plenty of time before the big event. Good luck. You can learn more presentation rehearsal techniques with a public presentation training course organised by Time to Market at a training centre near you. So, when the time is right to boost your presentation skills, please don’t hesitate to get in touch.